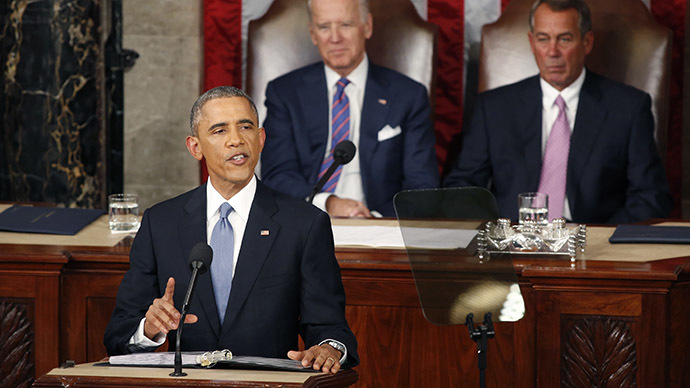 President Barack Obama pushed for a raft of proposals crafted to boost the middle class in his 2015 State of the Union speech, marking the first time he addressed a GOP Congress that largely opposes his governing agenda. To address these problems, Obama outlined plans that would increase the capital-gains tax rate on family incomes over $500,000 a year in order to pay for tax cuts for the middle class, close tax loopholes on inheritance, and provide students with two years of free community college education. Since Obama spent the past couple of weeks detailing these initiatives, he didn't spend much time diving into many details. Instead of going through a "checklist of proposals," he said he wanted to "focus more on the values at stake in the choices before us." The contents of his speech were even released to the public ahead of the event for the first time. As with his previous proposals intended to help the middle class, Obama faces a tough task in trying to get legislation passed through the Republican-controlled Congress. The GOP has come out against the president’s community college plan – calling it a“non-starter”– and has instinctively opposed tax hikes on the wealthy for decades, making Obama’s agenda unlikely to gain the support of conservative lawmakers. Nevertheless, Obama outlined an economic vision that could become the basis for the Democratic platform moving forward and into the 2016 elections. In addition to announcing tax and education plans, he called on lawmakers to establish paid family and medical leave programs for workers, to give government employees at least six weeks of paid parental leave, and offer cheaper child care for Americans. Obama added that it's past time for Congress to issue a law mandating that women in the same positions as men are paid the same amount. "This Congress still needs to pass a law that makes sure a woman is paid the same as a man for doing the same work. Really. It's 2015. It's time," he said. Looking beyond America’s borders, the president said the US is making progress in its effort to battle the Islamic State in Iraq and Syria (also known as ISIS/ISIL), and officially asked Congress to pass a resolution authorizing the use of military force against the group. Aside from the battle against the Islamic State, Obama said the US’ combat mission in Afghanistan is over for the first time since 9/11, noting that just 15,000 troops remain in the country – compared to 150,000 one year ago. On reestablishing diplomatic ties with Cuba, Obama said his administration ended a policy of isolation that was "long past its expiration date." He called on Congress to begin ending the embargo against the country, citing Pope Francis when describing the work of diplomacy is done in "small steps." This is the first time an American president has asked Congress to end the Cuban embargo. Obama also defended the White House's approach to Iran, saying more time is needed to see if world powers can negotiate an agreement with the country regarding its controversial nuclear program. He threatened to veto any bill that could derail talks by imposing new sanctions. "There are no guarantees that negotiations will succeed, and I keep all options on the table to prevent a nuclear Iran," the president said. "But new sanctions passed by this Congress, at this moment in time, will all but guarantee that diplomacy fails – alienating America from its allies; and ensuring that Iran starts up its nuclear program again. It doesn’t make sense." Meanwhile, he praised US policy for "opposing Russian aggression, supporting Ukraine’s democracy, and reassuring our NATO allies," saying that Russia is "isolated" and has an "economy in tatters." Speaking about the Guantanamo Bay prison complex in Cuba, Obama reiterated his intention to shut down the facility. Obama said America has a "profound commitment to justice," noting that the cost of keeping the prison open -- some $3 million per prisoner -- cannot be justified when the world is against its operation and terrorists use it as a recruiting tool. The president said the complex's inmate population has been cut in half since he became president. Notably, the president chose not to speak much on the topic of police reform, referring to the controversial deaths of Michael Brown and Eric Garner as "the events of Ferguson and New York." He called on people to understand a father's concern that his son would be harassed by police for walking home, as well as a wife's fear that her police officer husband could be injured or killed on duty. He noted that crime and incarceration rates are down, and said the country's criminal justice system should serve all Americans. However, police reform advocates criticized Obama for failing to dig into the issue and take a strong stand on it, especially considering the massive anti-police-brutality protests that have swarmed the nation. Seeking some common ground with the GOP, Obama renewed his support for a pair of international trade deals currently being negotiated with Europe and countries in the Pacific. Obama asked Congress to grant him “fast-track” negotiating authority to secure his ability to finalize the pacts and pass them through the legislative branch more easily, arguing that it's part of America's efforts to maintain influence in the Pacific. "In the Asia Pacific, we are modernizing alliances while making sure that other nations play by the rules -- in how they trade, how they resolve maritime disputes, and how they participate in meeting common international challenges like nonproliferation and disaster relief. And no challenge -- no challenge -- poses a greater threat to future generations than climate change." Supporters say the deals will open new markets for American goods and boost the economy. However, opponents have criticized the potential agreements for being conducted largely in secret. Leaked reports on their contents suggest they are too corporate-friendly, reduce regulations on companies, and decrease internet privacy. Obama also prioritized efforts to enhance cybersecurity in the wake of the hack against Sony. The president wants Congress to pass legislation, which requires companies to notify customers if their data has been compromised within one month of a breach. He also called for a law that would promote information sharing between the government and the private sector. “No foreign nation, no hacker, should be able to shut down our networks, steal our trade secrets, or invade the privacy of American families, especially our kids," Obama said. "We are making sure our government integrates intelligence to combat cyber threats, just as we have done to combat terrorism." Additionally, the president reiterated his support for municipalities to build their own internet infrastructure, a proposal that, if supported by the Federal Communications Commission, would bypass laws on the books in about 20 states that ban local governments from offering their own internet service. Obama also pointed to a climate change pact sealed with China late last year as a sign that America is focused on fighting global warming. He added that 14 of the warmest years ever recorded have occurred during the last 15 years, indicating that scientists are right when they say the Earth is getting hotter. "The best scientists in the world are all telling us that our activities are changing the climate, and if we do not act forcefully, we’ll continue to see rising oceans, longer, hotter heat waves, dangerous droughts and floods, and massive disruptions that can trigger greater migration, conflict, and hunger around the globe," the president said. "The Pentagon says that climate change poses immediate risks to our national security. We should act like it." On a more lighthearted note, many Americans breathed a sigh of relief when the president chose to deliver his speech in a navy blue suit. Prior to the speech, the White House tweeted a picture of the tan suit Obama wore during a press conference last year -- an outfit that earned him numerous snide comments from sartorial critics everywhere. Fortunately, the president decided to leave that suit behind. The president wasn't the only Obama making a fashion statement Tuesday evening. His wife, Michelle, drew the attention of Americans and social media users by wearing the same dress as the character Alicia Florrick from the popular television show "The Good Wife."